It's time for a sweet treat! I've always been curious about using avocados as part of a dessert recipe. I've associated the avocado as a fruit to be enjoyed only in savoury dishes with lots of garlic, onion, tomatoes and lemon like in a guacamole (Mmmm). I've read lots of raw and vegan style recipes and see the use of avocado pop up a lot in desserts and smoothies, so I thought I would give this one a try. Who doesn't love pudding? When I was a kid, it was a once in a blue moon treat for my mom to pick up those little containers of chocolate pudding for me. They'd magically appear in my lunch and I'd be so excited. I shoved those things so fast down my throat . . I was never one to savor, but still thoroughly enjoyed. Moving out in my twenties gave me permission to be responsible for purchasing and preparing my own food and I'd be lying if I said that pudding wasn't a regular item on my shopping list. Usually coming in packs of 4 - 6, I'd take all of them down together like a champ. Those were the days. But now, being more conscious of my food choices, I decided to try this recipe and was pleasantly surprised. The texture is thick and super smooth. The banana sweetens it up nicely but if you enjoy your pudding a little sweeter, you can add unpasteurized honey or a good maple syrup for a desired sweetness. The raw cacao powder rounds it out with its super rich chocolate flavour. 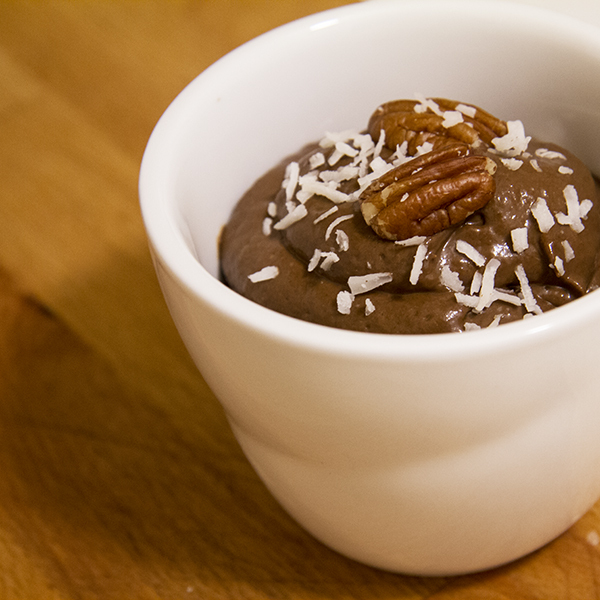 This pudding packs a nice punch of antioxidants, magnesium, potassium and monounsaturated goodness. Combine avocado and banana in a food processor and blend until smooth. Add cacao, vanilla and optional honey/maple syrup and blend again until a smooth consistency is reached. Enjoy straight away or refrigerate in a sealed glass container for a cool creamy treat (I like my pudding cold). Enjoy within 3 days! This looks very tasty, Katherine! I've never had avocado in a sweet dish either but will give this recipe a try. PALEOdISH last minute gift guide 2016!